Based on yesterday’s and this morning’s market events around the world, it appears that what might have been a small snow slide resulting from problems in the US subprime mortgage sector has turned into a true avalanche involving multiple market sectors and geographies. Sectors as apparently far afield as commercial paper, equity “quant” trading, and overnight bank credit markets all seem to be roiled with troubles. But is the contagion spent already, or is it gathering momentum? This writer and many others have pointed to the principal sources of this contagion across sectors: cross-sector investment portfolios (which transmit selling pressure across nominally unrelated security classes and markets when price declines in one market encourage an investor to liquidate unrelated securities to meet margin or redemption requirements) and financial leverage applied to portfolios. This writer has further maintained that—notwithstanding the broad dispersion of risk across investors in recent years—market-making investment banks remain important if not critical transmitters of both of these forces in the market. Unfortunately, knowing the proximate causes of contagion in the markets does not provide much illumination as to when and whether the meltdown will stop, or indeed how further contagion might play out. To get some sense of the landscape, one needs to step back a level or two and think about the market as a chaotic, non-linear dynamical system, and the current swoon as a phase change in a system which has organized itself into a critical state. In this view, “the market” is a complex system composed of numerous interacting elements, where the interactions are characterized by non-linear features such as feedback, looping, etc., and one in which the history of its development has brought it to a critical state, in which a small change in one of its variables can trigger an abrupt change in the state of the system. So in seeking some answers concerning the rhythm of the pile’s growth, Bak and his colleagues turned to the computer. They instructed it to drop imaginary “grains” onto an imaginary “table,” with simple rules dictating how grains would topple downhill as the pile grew steeper. What they discovered was not reassuring for fans of the stable and predictable. The first big surprise came as the answer to a simple question: What is the typical size of an avalanche? How big, that is, should you expect the very next avalanche to be? 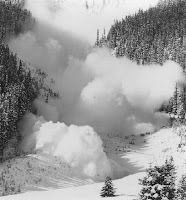 The researchers ran a huge number of tests, counting the grains in millions of avalanches in thousands of sandpiles, looking for the typical number involved. The result? Well... there was no result, for there simply was no “typical” avalanche. Some involved a single grain; others ten, a hundred, or a thousand. Still others were pile-wide cataclysms involving millions that brought nearly the whole mountain tumbling down. At any time, literally anything, it seemed, might be just about to happen. ... Bak and his colleagues next played a trick with their computer. Imagine peering down on the pile from above, and coloring it in according to its steepness. Where it is relatively flat and stable, color it green; where steep and, in avalanche terms, “ready to go,” color it red. What do you see? They found that at the outset the pile looked mostly green, but that, as the pile grew, the green became infiltrated with ever more red. With more grains, the scattering of red danger spots grew until a dense skeleton of instability ran through the pile. Here then was a clue to its peculiar behavior: a grain falling on a red spot can, by dominolike action, cause sliding at other nearby red spots. If the red network was sparse, and all the trouble spots were well isolated from each other, then a single grain could have only limited repercussions. But when the red spots come to riddle the pile, the consequences of the next grain become fiendishly unpredictable. It might trigger only a few tumblings, or it might instead set off a cataclysmic chain reaction involving millions. The sandpile seemed to have configured itself into a hypersensitive and peculiarly unstable condition in which the next falling grain could trigger a response of any size whatsoever. So, if the timing and size of a phase transition in a relatively simple complex system—a virtual sandpile consisting of uniform grains subject to simplified forces of gravity and friction—is a priori unpredictable, what are we to say about a complex dynamical system like the global financial markets? What Mr. Bookstaber does not address is what one might call the “loose coupling” that develops in financial markets as an emergent feature of their development. While it is true that margin loans, repo agreements, and most derivative securities can be characterized as tightly coupled, I think few would argue that the links leading from subprime mortgage collapse in the US, through investors such as IKB and BNP Paribas, to the asset-backed commercial paper market are anything but loosely and contingently related. And yet such couplings provided effective pathways for market contagion to spread. Finally, one cannot ignore an increasingly important pathway for contagion in the current market crisis, one which is now taking center stage. This is, of course, the wholesale panic and near paralysis gripping investors across the globe as they run in fear from the market meltdown. After all, the metaphors and analytical frameworks we have been discussing have their predictive limits, even in broad outline. Grains of sand are not conscious, and they cannot and do not alter their behavior based upon the actions of their neighbors, much less those on the other side of the sandpile. Even the complexity and tight coupling of intercreditor agreements, repos, and derivative contracts are relatively mechanistic things, and should play out based upon their engineered characteristics. But one cannot predict the behavior of human beings very well at all, and an investor in Minsk or Rio de Janeiro with no margin leverage or other pressure to sell may very well liquidate all his US stockholdings purely out of a sense of fear (or prudence). On the positive side, the sheer breadth and diversity of hedge fund investment strategies must mean that there are a bunch of guys out there making a killing in this market. (It might not be the obvious suspects, though.) Furthermore, people have been paying hedge fund traders 2-and-20 for years on the assumption that they are simply better at trading than mere mortals and can deliver better than market returns in periods of market distress. Now is the time for them to deliver, or go back to scalping client tickets on the govvie desk. Also, there was a day when volatility was an investment bank’s friend. We will see if any of them are able to counteract the carnage in their principal portfolios and their margin books with healthy trading results. And one final thing: I think the market gods would react quite nicely if the current brouhaha deflated some of the hubris and vanity sucking up all the air in Manhattan and Mayfair. We might even be able to get a decent lunch reservation once in a while. 1 Mark Buchanan, Ubiquity: Why Catastrophes Happen. New York: Three Rivers Press, 2001, pp. 19–20. 2 Richard Bookstaber, A Demon of Our Own Design. Hoboken, NJ: John Wiley & Sons, 2007, p. 144.